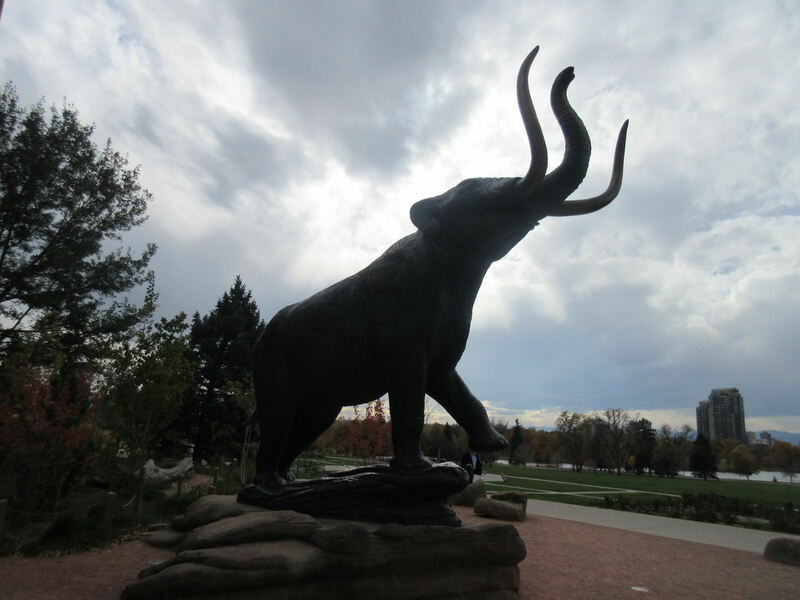 The Springs in Fall — 2015 Photos #19: The Denver Museum of Nature & Science on $0.00 a Day « Midlife Crisis Crossover! Remember, kids: if it isn’t packed with eighty-six tons of dinosaur fossils, it isn’t a real science museum and you should report it to your local science authorities right away. After lunch and conversation with an old friend in Denver, I spent a bit more of Day Four wandering a few other locations over the next two hours. Halfway through our week, though, a bit of budget consciousness was tampering my mood, leading me to think carefully how else I spent my remaining time and personal funds in Colorado. That’s what happens when you can’t normally afford two vacations a year but can’t resist a good deal on a second one. 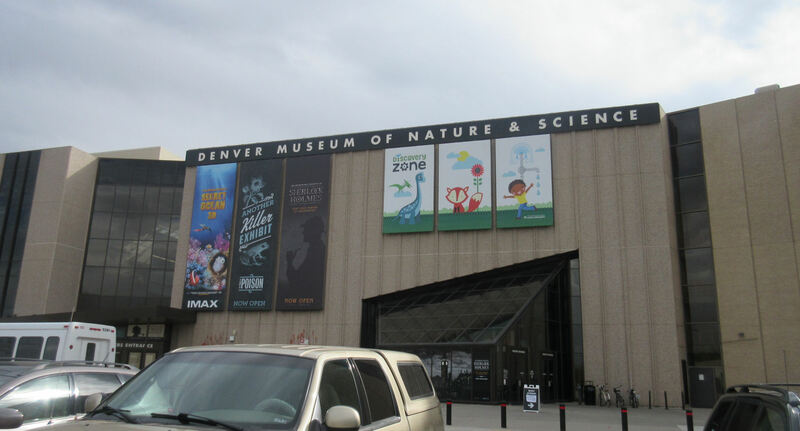 Not far from the Denver Biscuit Company and All in a Dream is the Denver Museum of Nature & Science, five hundred thousand square feet of Smithsonian-affiliated exhibits, experiments, and special presentations about all the niftiest sciences ever. For visitors in a cheapskate position like me, a few points of interest stand on the path leading from the free parking lot to the ticket counter, a.k.a. the point of no return. I’ll confess the poison exhibit sounded weirdly tempting. But was it alone worth the ticket price? Sadly, I’ll never know. 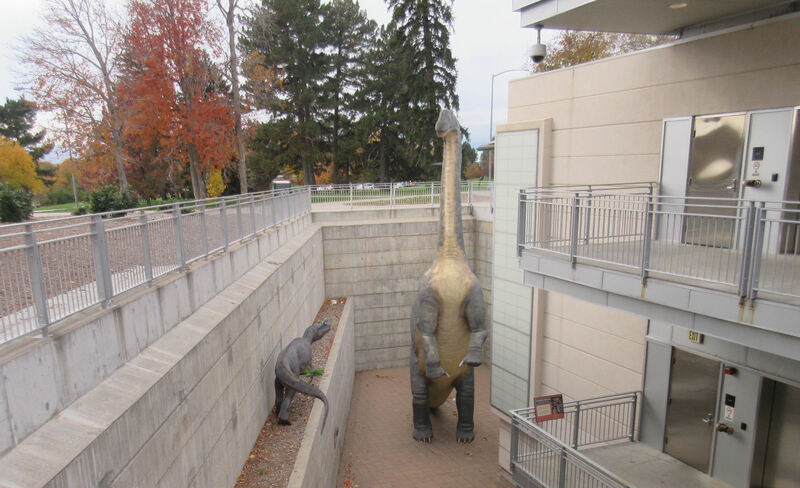 Longtime MCC readers may recall similar recounts regarding the Science Museum of Minnesota and the Birmingham Museum of Art, where we basically window-shopped but stopped short of devoting time to what probably could’ve been an all-day experience. To be honest, my family has seen so many natural museums on our road trips over the years (DC, NYC, and Chicago being among the headliners) that they’re no longer an automatic attraction for us. It’s a sad first-world problem when dinosaur fossils lose their luster and begin to look alike from one major city to the next. But Denver’s version looks nice and formidable from the outside. Their website says they currently have an exhibit about chocolate, and a new one about robots opening March 18th. If those had been around last November 4th, I might’ve thought twice. Such is the drawback of temporary and traveling exhibitions. Dinosaur parent and child guard the parking garage elevators. 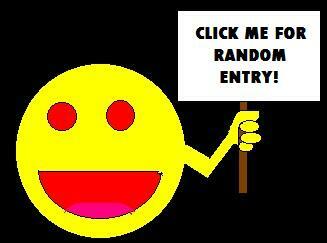 So don’t try anything funny. At the corner of the building, a mastodon treads with triumphant trumpeting. Or maybe it’s a basic elephant of sorts. Definitely not a woolly mammoth. 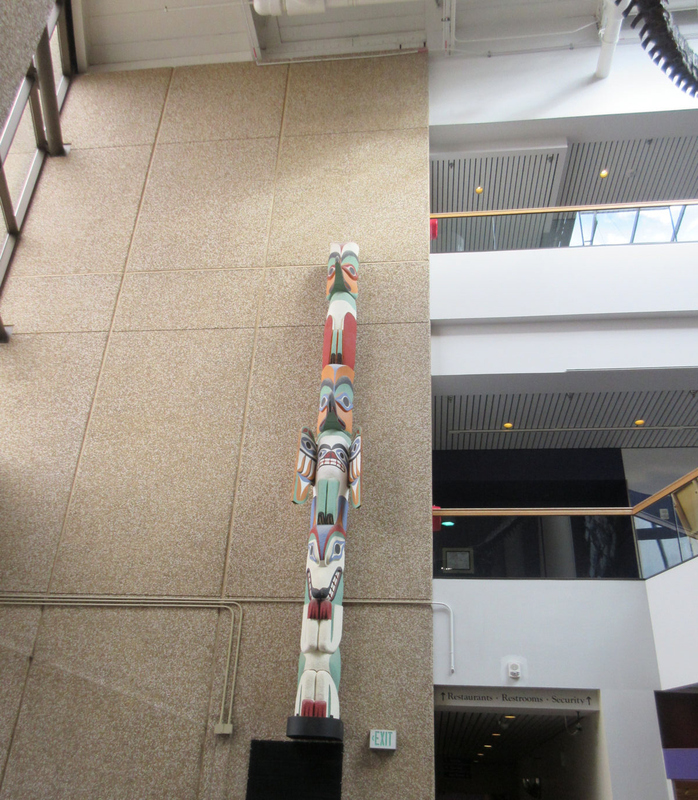 The story of this totem pole is, natural history museums aren’t just about dinosaurs. World history contains myriad stories that fall after their extinction and before the 2016 election. 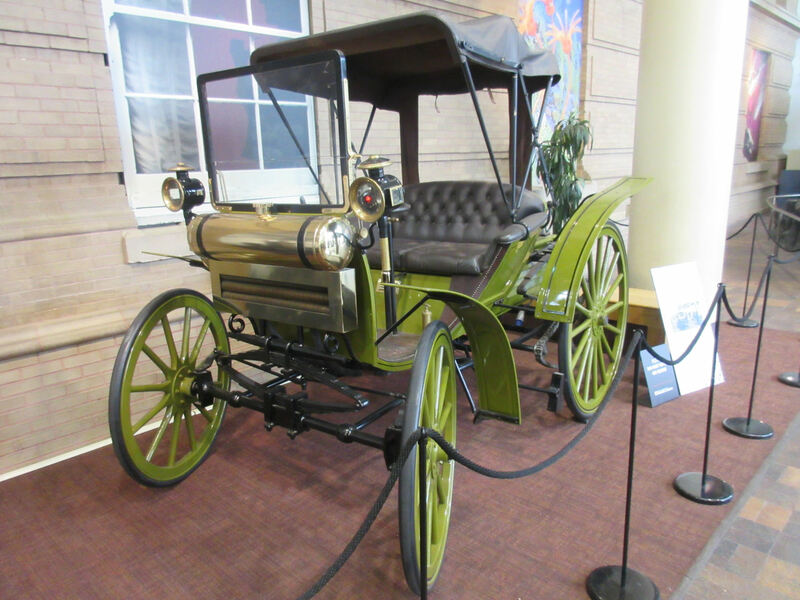 Fun movie prop in the lobby: a 15-horsepower antique auto used in the filming of Sherlock Holmes: Game of Shadows. 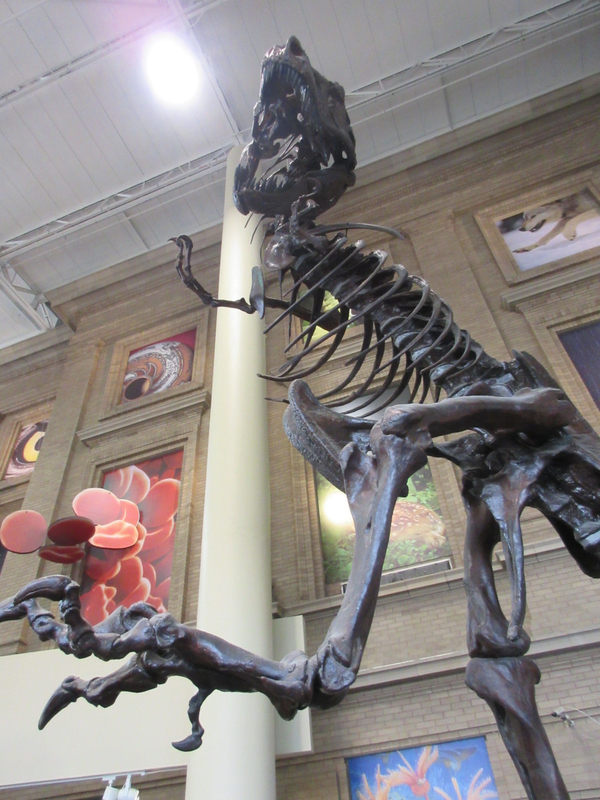 …and then a well-meaning security guard eyed me and took a step in my direction with a look that said, “I SEE YOU THERE, PREDATOR.” Thus I did an about-face, exited, and concluded my brief tour of the Denver Museum of Nature & Science. Highly recommended based on surface elements, bonus points for free parking, would browse again, 10/10.